And now, the piece de resistance of my Cookout Week, dessert! 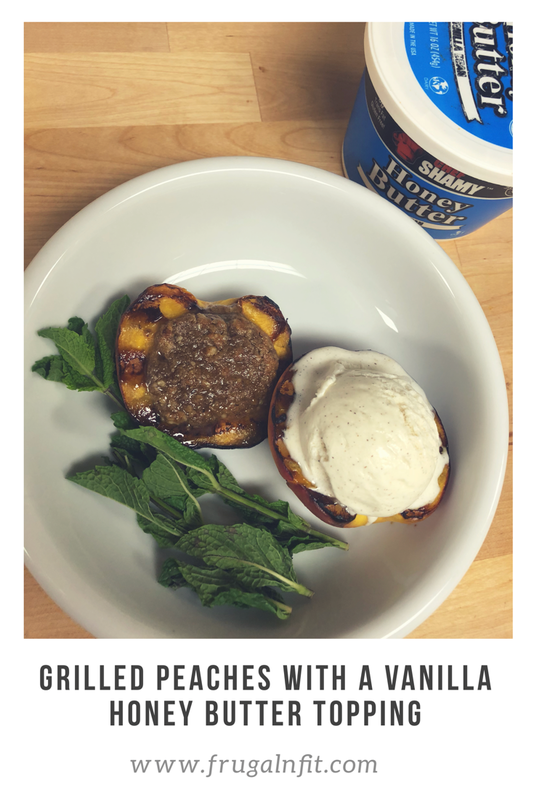 Grilled peaches with a vanilla butter crumb topping? Yes, please! By far, this recipe received the most accolades from friends and family who came to sample all my recipe endeavors over the last couple of weeks. Of course, right? Everyone loves dessert! Before going to a “paleo-ish” lifestyle, I was kind of a famous baker. Ok, not really, outside of my circle of friends and family, but I was always the one to bring birthday cakes or Christmas cookies. The recipe that was most popular? Bourbon Peach Hand Pies from Smitten Kitchen. The dough basically took all day to make but it was totally worth it! Flaky, buttery goodness with the best peach filling in the world! Even my mom liked them and she’s not a peach fan. I also made a mean German Chocolate Cake. I bet I could replicate that in a grain-free version. Might have to try that sometime soon. The other recipe that I completely miss are Italian pizzelles. I make a mean pizzelle. In high school, we had a substitute teacher that would bring her pizzelle maker in and make us fresh, warm cookies if she subbed for your class twice in the same school year. Didn’t happen often (I think only once for me!) but when it did, it was the best day! Both sides of my extended family are Italian (my mom’s adopted) so these cookies have been a long-time tradition for us. Pizzelles not even just a Christmas tradition in my house. My mom made them all year long! Jeremy, my younger brother, calls them waffle cookies because they look like a little waffle and you make them in what looks like a waffle iron. They’re his absolutely favorite! Bourbon Soaked Peaches, does it get better than that?! I digress. Back to the bourbon peaches. Since I’m not able to make those tantalizingly buttery pastries, I’ve concocted a rich, buttery topping over grilled peaches. Soaked in bourbon overnight, these peaches are then grilled to give a caramelized sugary crust. After I quickly grilled them over high heat, I topped each half with my streusel topping (courtesy of Chef Shamy!) and lowered the heat to medium. Then these bad boys roasted for about 20 minutes until the topping had baked through and was a nice golden brown. Top them with some coconut whipped cream or ice cream (depending on what you can tolerate!) and you’ve got one scrumptious treat that screams summer. Let me just shout the praises of our fabulous Cookout Week sponsor, Chef Shamy. I had never tried their butters before but let me tell you, they won’t disappear from my kitchen staples again! They come in several different flavor combinations. Chef Shamy sent me their Garlic-Parmesan and Honey Vanilla butters to test out. The honey vanilla flavor features not only in this recipe, but my first Cookout Week recipe, the Pecan Pie Stuffed Sweet Potatoes. As of right now, that recipe is now the top recipe on my site in terms of repins, shares, and pageviews! Make sure you check it out too! Thanks to our fabulous #CookoutWeek sponsor, Chef Shamy! Chef Shamy butters contain no oils and would be a great addition to any Keto recipe. Just be careful with the sweet flavors as they do contain sugar. They’re shelf stable and can be left out room temperature for up to 3 months, sealed. They last up to 3 years in the freezer and 6 months in the refrigerator! I’ve used both butters in numerous dishes so far. My favorite is melted on top of popcorn! If you’d like to try these wonderful butters out, you can use coupon code 10BUTTER10 through the end of the week on their website to receive 10% off your order. You won’t regret it! They can also be found at Sam’s Clubs across the country. Place peach halves in a large mixing bowl. Pour bourbon over the top of the peaches and refrigerate overnight. Preheat grill on high. 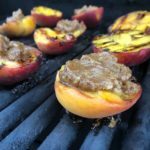 Place peaches open side down and quickly grill 2-3 minutes until nicely charred. Meanwhile, mix baking mix, vanilla, butter, cinnamon, sugar, and walnuts together in a small mixing bowl until a loose crumble appears. This is your streusel topping. Add more butter or flour mix if desired to get the consistency you’d prefer. 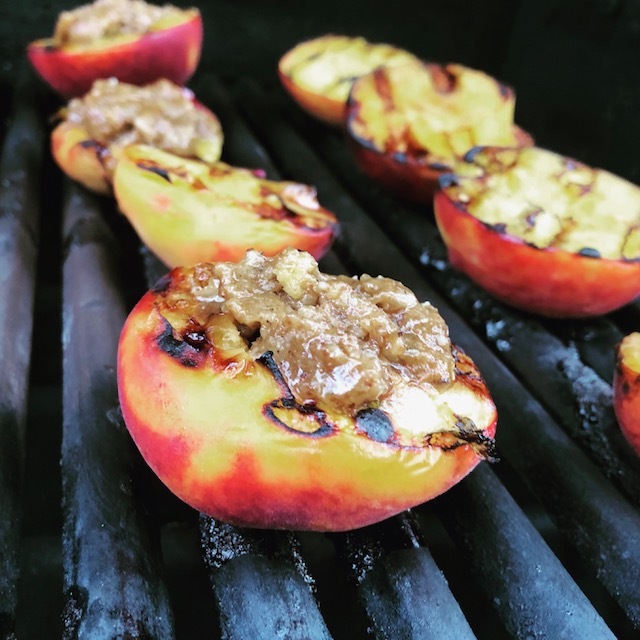 Flip peaches over on the grill. Scoop a heaping tablespoon of streusel topping into each center. Lower grill temperature to medium-low and bake for 20 minutes until peaches are tender and topping is lightly browned. Remove peaches from grill. Plate as desired and top with ice cream. Enjoy! Now that’s what I’m talking about….the perfect ending to a great meal. This sounds absolutely delicious! I can’t wait to try these! These look so, so good! Perfect dessert for a hot summer day! Thank you! They absolutely are!